Roast Chicken on a Bed of Onions, Thyme for Cooking gourmet main course. Roast chicken is always a favorite. 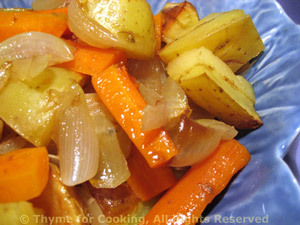 This sits on a layer of onions and is finished with the potatoes and carrots on the side. As always, a meat thermometer is invaluable. Mix the rosemary, thyme and butter. Put the butter/herbs inside the chicken. Slice the onions and put into the roasting pan, spreading out just enough to be under the chicken. Lay the chicken on top, breast side up, insert thermometer if using. Mix the soy sauce, vinegar and ginger. Brush over the chicken and roast, 375F (190C) for 40 minutes. Combine the chicken stock and white wine. Remove the chicken, arrange the potatoes and carrots around the chicken, spoon 1/4 of the basting sauce over the chicken and return to oven. Continue to roast for another 45 minutes, basting with 1/4 of the sauce every 15 minutes. 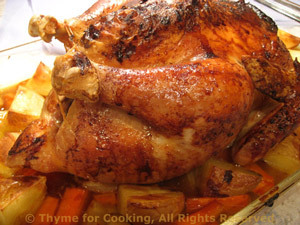 Chicken is done when thigh temperature reaches 170F (77C) and the juices run clear. Remove chicken to a platter, cover loosely with foil and let rest while you finish. Remove vegetables and cover to keep warm. Pour 1/2 cup chicken stock into the roasting pan if needed. Scrape up any brown bits and pour it all into a small saucepan. Use more chicken stock if needed. Slowly pour into saucepan, stirring until clear and thickened to your liking. Carve chicken and serve, gravy on the side.